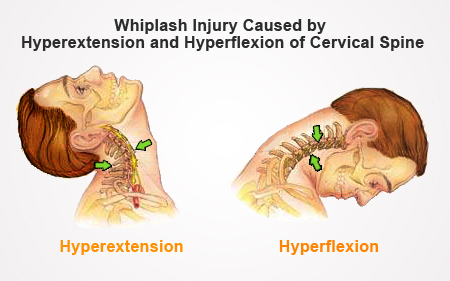 Whiplash is a common neck injury that people often ignore or mistreat. It usually results from a rear impact while one is in a stationary position. Early motion and exercise treatment leads to a rapid recovery. However, without proper education and treatment, patients who suffer from whiplash injury may experience chronic symptoms, including anxiety and depression. Whiplash injury is a term that describes damage, involving both the bone and soft tissue structures, while whiplash associated disorders consist of more chronic and severe conditions. Whiplash injury is usually not life threatening, but it may lead to partial disability. Furthermore, it can lead to significant expenses related to medical care, lost productivity, sick leave and litigation. While it seems that there are relatively minor injuries involved in whiplash, some people experience a wide range of chronic symptoms after the accident. Although this has led some victims of road accidents to pursue personal gain through litigation, whiplash is a recognized medical condition with real symptoms. Vehicular accidents, usually from rear-end collisions. Physical abuse, which involves punching or shaking, such as injuries involved in shaken baby syndrome. Sports-related collisions that can occur in football and other contact sports. What Symptoms Will You Experience If You Got a Whiplash Injury? A thorough clinical evaluation consists of history taking, wherein your doctor will ask you to describe what happened during the incident and what your symptoms are, as well as a physical examination, which determines the extent of injury, range of motion and points of tenderness. Further examination may involve taking a head, neck and spine X-ray to visualize the area of injury and to rule out other conditions such as arthritis. Other imaging tests such as MRIs or CT scans may be requested to assess inflammation or damage in the spinal cord, nerves orsoft tissues. What Are the Treatment Options for Whiplash Injury? Medications. Over-the-counter pain relievers like aspirin or Tylenol may relieve mild pain. However, with severe injuries, your doctor may prescribe prescription painkillers such as non-steroidal anti-inflammatory drugs (NSAIDs) like naproxen (Aleve) oribuprofen (Advil, Motrin) and muscle relaxants for relief of muscle spasms. Physical therapy. Your doctor may suggest simple measures such as heat therapy and ice application to reduce inflammation and physical therapy exercises to promote muscle strength and neck flexibility. Ice. Immediately applying ice to your neck after the injury can help reduce pain and inflammation. Do this for about 20 minutes every 3 to 4 hours for 2 to 3 days. Be sure to wrap the ice in a cloth or towel to prevent skin injury. Neck collar or brace. A foam collar may be used for short periods (not more than 3 hours at a time) to keep the neck stable. Your doctor may also recommend using a neck brace if needed. Prolong use of these devices is not advisable because these can cause thinning and weakening of the neck muscles. Moist heat. After swelling subsides with ice application for 2-3 days, use warm, moist towels to apply moist heat to your neck. You can also take warm baths. Simple exercises. Gentle neck and motion exercises can help restore neck muscle strength and flexibility. Relaxation techniques.The National Institutes of Health recommends maintaining good posture and practicing relaxation techniques to prevent straining of the neck muscles for a faster recovery. Acupuncture. This technique is often used to as complementary treatment for various types of chronic pain. Chiropractic care. Spinal adjustment by manual manipulation is another complementary treatment that may be used to treat pain in the neck and spine. Ask your doctor if this type of treatment is suitable for your condition. Massage. This technique may help relieve tension in your neck muscles and reduce stress and anxiety. Electronic nerve stimulation. Using electric current treatment is one of the common techniques to reduce the pain of a whiplash injury. Can You Prevent Whiplash Injury? Do some exercises. Try some easy exercises to strengthen and limber your neck muscles, especially if you have had neck strain before. Take regular breaks when working. If you are an office worker, or need to sit all day long to work, you really should regularly take a break, stand up and stretch your neck when walking around to avoid your muscles get too exhausted.